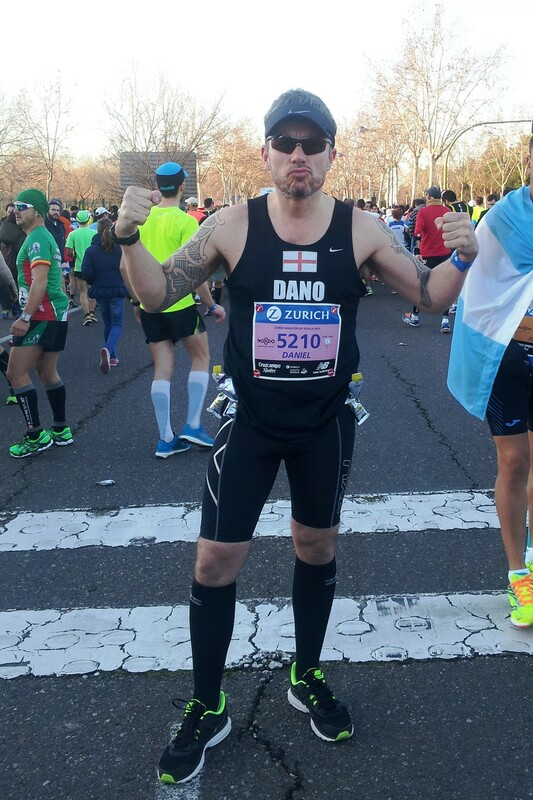 My third race in Spain, previous being Barcelona Marathon and Rock ‘n’ Roll Madrid, and it was back to the marathon. 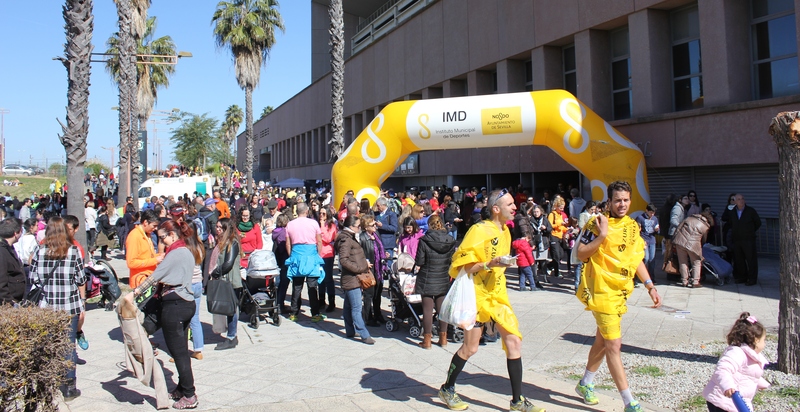 It was my first time to Seville and I was anticipating a flat course. Everything was seemingly in place for a good race despite my niggling hamstring injury. The Expo was held at the Fibes Conference & Exhibition Centre in the east of the city. The highlight was speaking to the friendly and informative Magda at the Warsaw Marathon stand, a race I already had my eye on. Magda herself was also running Seville, but more as a sightseeing run having not done a lot of training. Magda explained that compared to other European cities Warsaw is very affordable to visit, and that its old town, nearly completely destroyed in WWII, has amazingly been reconstructed to almost its original state. Warsaw is still on my list but will have to wait until after this year since I’ll be running Chicago in October instead. 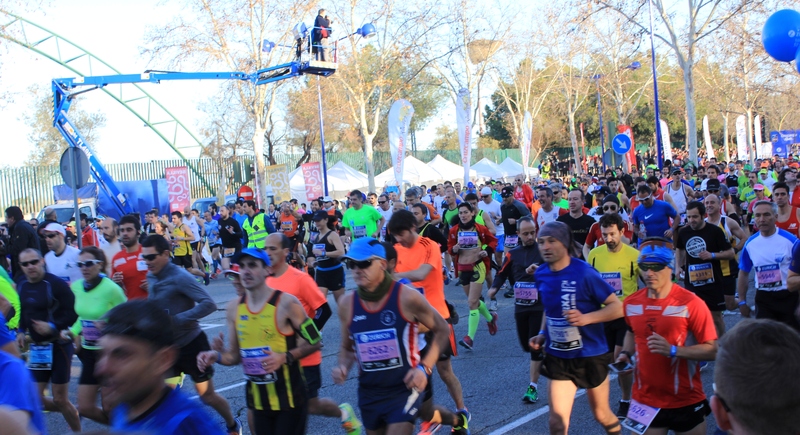 It was a brisk 20-minute walk over Puenta de Barqueta (bridge) from our base at Plaza Alameda de Hercules to the start area. The sight of other runners en-route calmed my nerves and I visualised finishing and having that well-deserved post-race beer with Ro. Upon crossing the Guadalquivir River we passed the Isla Magica theme park and soon after could see the start area ahead. 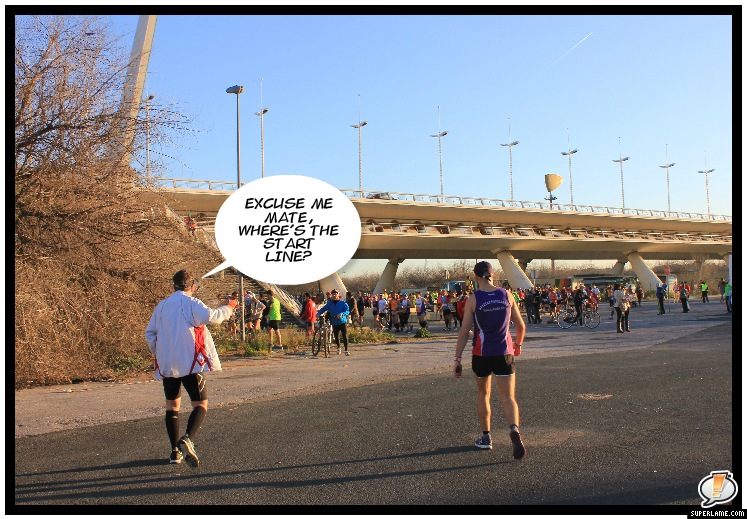 However reaching this point it wasn’t possible to enter the pens and runners were routed around a relatively big industrial block and over a motorway bridge in order to approach the starting corrals from the back. There was no sign of marshalls but plenty of lost and confused looking runners trying to get into the pens. A good 10-15 minutes later and I was into mine. A quick goodbye to Ro and it was elbows out time for me to be able to get into my pen. AC/DC blared out upon starting (always a fave at the start line it seems), after a countdown in Spanish. Crowds were fairly strong and seeing Ro within the first 100 yards was a great lift. All was good in the world as the sun slowly rose over the flat course. I lost a couple of minutes within the first kilometre however as I took a quick loo stop and I was already doubting I’d get my PB. The kilometres started to pass by with support and entertainment appearing every now and then but with no real ‘umph’ or inspiration – maybe that was just me. In total there were around nine bands along the whole 42 km, not enough in my opinion. Scenery-wise, again nothing of any real note, surprising as I had expected and read the opposite. Hitting 15 km and support was great; lots of cheering, shouting which was a real boost to the mind seeing as the previous kilometres had not given much back. Water stations were every 2.5 km which was good especially as the weather was starting to warm up the later it got. 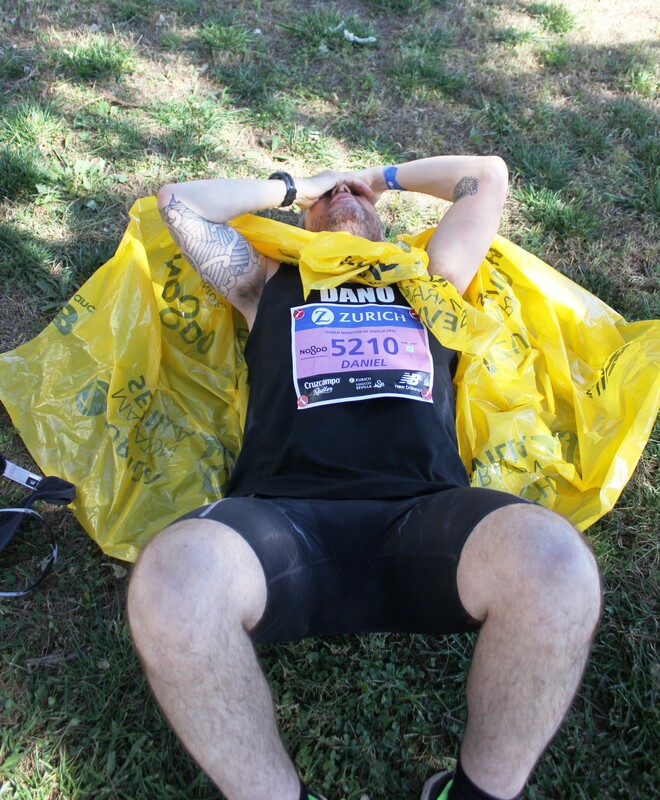 My hamstring was behaving itself to a degree however at 18 km my right calf had a mini-spasm – whether it was the onset of cramp or a muscle about to pull I don’t know but what I did know was that I had to manage this carefully otherwise it could be game over. I had never felt anything like this before and gave my new trainers a good hard look thinking they could be the cause. With 25 km or so to go my race plan was starting to go out of the window as were all ideas of a PB. Slowing down to manage both legs I passed 21 km in a much slower 1:53. I had calculated before the race that I would need to reach 21.1 km at 1:45-1:48 to achieve a PB. Breaking for a second loo break around 25 km, this was a first for me. I started to wish I had my music with me as with the continuing lack of consistent good support, music and overall scenery my mind seemed to just focus on the the negative; hamstring, calf, trainers. Coupled with this my Garmin watch decided to not give me split times but just an overall stopwatch of time and kilometres done, another annoying disruption to my race plan. The only highlight was seeing Ro at 27 km and photobombing a Japanese couple ahead of me who were taking a selfie of runners as we passed. I received a great cheer from supporters on this which was a good laugh and lift. With my new trainers, Nike Zoom Winflo, now starting to lack bounce/cushioning, my legs were starting to feel heavy and my quads felt like lead piping. How I wished I had kept to my usual Nike Icarus. Schoolboy error! With 10 km to go I was starting to struggle physical and mentally. The weather was a very warm 21 degrees by now and as I have experienced previously, at Budapest Marathon, I suffer in the heat. Taking on more fuel and now the odd banana slice, the refreshment stations were becoming a good distraction and on the odd occasion an excuse to stop and re-focus. Into the last several kilometres and support and scenery vastly improved. 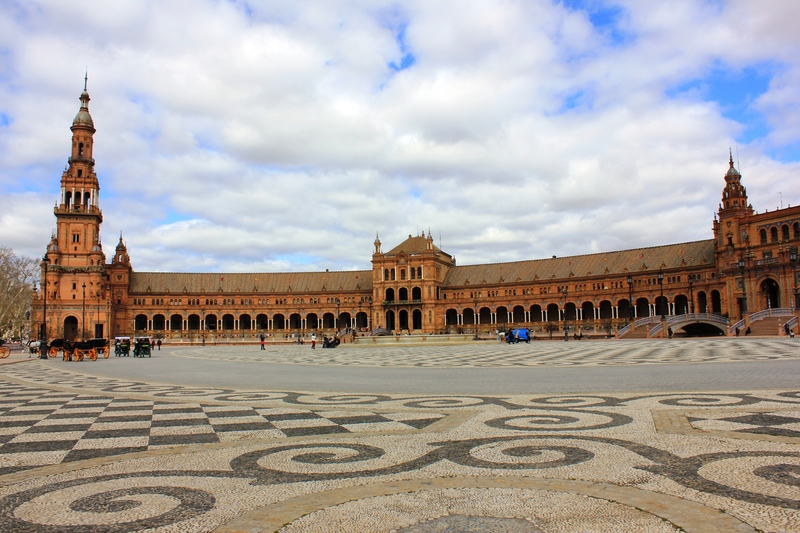 Running into the Maria Luisa park and doing a mini lap of the Plaza de España was lovely. Exiting the park it was head down and teeth grit to the finish line in the (never used) Olympic stadium ‘la Cartuja’. The surrounding area near the finish was very derelict and void of support, and again I stopped. Admittedly I was very frustrated at having to stop again but thought best I listen to my body. Running resumed and coming into the last kilometre support was up and the stadium was in view as was Ro cheering me on. God how I needed that. Sun was beaming down as I entered the stadium and several hundred spectators were in the stands. I ran a final lap with sheer determination to the finish line. It had been a tough race. Leaving the stadium track with medal in hand runners were ushered into the exit tunnels where there were several tables of drinks, food and a goodie bag with more drinks. The exit took us to the back of the stadium. As I rested on the grass outside the stadium and waited for Ro I found myself next to the professional runners waiting for their bus. I slowly walked over to Bekele, second in the women’s race, and proceeded to get a selfie. From the finishing area it was a nightmare to get back into the centre of town (as were the random queues on the side of the road for taxis). No buses, marshalls or signs were apparent to assist runners with directions. We found our way eventually but this was not good and the last thing you need after a hard race. Back into La Alameda and we found the nearest cafe to sat down at in the sun for a few beers and a bucket of chicken wings. I was frustrated at my run but pleased to have finished and again learnt a lesson about kit, food, injury management and more importantly, never to underestimate 26.2 miles no matter how much you think you know.